Most users ever online was 458, 04-06-2019 at 05:37 AM. 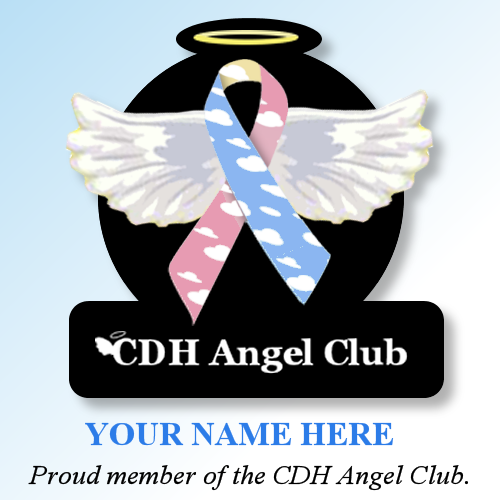 Join the Angel Club and make a daily, weekly, monthly or annual donation in honor or in memory of your cherub. More amount options can be found on our Angel Club page. CHERUBS is an IRS recognized 501(c)III organization run solely by volunteering CDH parents, grandparents and survivors working to help other families affected by Congenital Diaphragmatic Hernia. Please donate to help further our work. Click here to learn more about our Congenital Diaphragmatic Hernia Awareness campaign, "Save the Cherubs" and how you can participate! Welcome to the New CDH Forums! Welcome to our new CDH Forums! We are still working out a few bugs so bear with us. New Member? - Sign up for FREE here - http://www.cdhboards.org/register.php. You must be a member to sign in with Facebook. Waiting Approval Moderation? - All new users must be vetted and approved for the safety and security of our membership. Make sure your username is FirstnameLastname (nicknames are not allowed), all forms are filled out and dates are in YYYY-MM-DD to speed up approval. Find A Problem On This New Forums? - Post problems here please! Remember, Our Forums Have Rules! - These are support forums and we work hard to keep them supportive, positive, safe and confidential. We expect all members to follow these common courtesy rules. And remember - all cherubs are different! Do not replace information or advice from others as proper medical care. CHERUBS prohibits the giving of any medical advice.